There is one primary reason that community association companies such as Faith Property Management are called upon to take on the duties of an HOA manager: problems. That might sound like an overly simplistic answer, but the simple fact is that most people don’t want to deal with problems or be “the bad guy” in the neighborhood. While it might not be hard to set up meetings and take votes on the most common changes to HOA rules, dealing with the problems that arise when dozens (or hundreds) of homeowners are involved can cause many boards to contact an HOA management company. If you’ve been involved in any sort of community association, you probably have some idea of what we’re talking about when we say “HOA problems.” Here are some of the most common problems that we take off of people’s plates when we become their HOA property managers. We admire it when people listen to their entrepreneurial spirit and decide to start their own business. The problem comes when they choose to open it in the wrong place…namely their home. It’s simply not allowed in most HOA covenants. Luckily, most HOA rules have iron-clad restrictions against the types of home-based businesses that can be in a neighborhood. Many of these are backed up by city zoning laws, but the homeowner in question still has to be informed of the violation and how they can resolve it. That’s where professional association management services come in. There are few more contentious parts of an HOA than dealing with HOA fees. While many homeowners take full advantage of green spaces and the covenants that keep the neighborhood in order, they might balk at paying the HOA fees they agreed to when they bought the house. As part of our HOA management services, we can collect HOA fees and deal with people who are reluctant to pay. There are over 270 million vehicles in America, and doesn’t it seem like they’re all parked along your street? People’s garages are overflowing with stuff, which means they’ll often park their vehicles in the driveway or along the street. 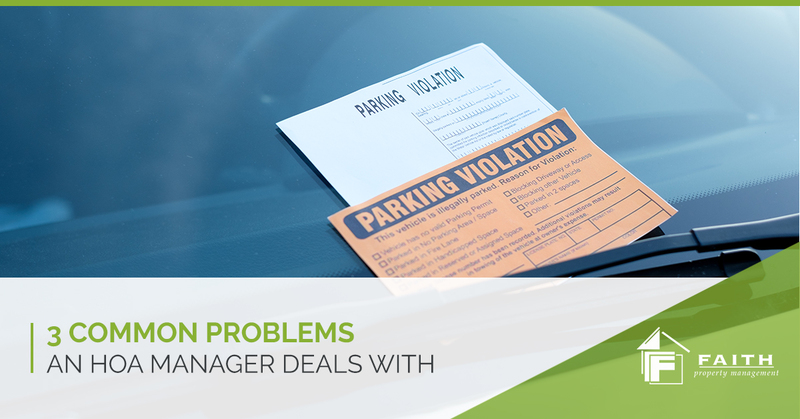 While parking on the street might be allowed by your covenants, it often leads to problems that HOA management companies have to address. The most common HOA problems with vehicles include boats, RVs, and derelict vehicles. If your HOA states that boats are not allowed on the property, we can enforce that. If a vehicle has to be moved every seven days and an RV hasn’t moved in a month, we’ll get involved. And if a vehicle is sitting on the street without an engine, we’ll make sure that the homeowner understands the consequences of not moving it. Contact Us For HOA Management! If you’re on an HOA board and are tired of dealing with common problems that are taking up all your time, hiring HOA managers might just be the solution you’re looking for. Faith Property Management is ready to take care of the situations we mentioned above, as well as more that we’ll discuss in the next blog. If you’re ready to make your life easier, contact us today!